A team of scientists at MIT have developed a new light source from a fiber roughly as thick as a human hair. The fiber has a hollow core with a droplet of fluid inside, surrounded by alternating layers of materials with different optical properties, which emits light when the droplet receives energy. Most light emitters, from candles to light bulbs to computer screens, look the same from any angle. But in a paper published this week on the Nature Photonics website, MIT researchers report the development of a new light source — a fiber only a little thicker than a human hair — whose brightness can be controllably varied for different viewers. The fiber thus opens the possibility of 3-D displays woven from flexible fibers that project different information to viewers’ left and right eyes. The fiber could also enable medical devices that can be threaded into narrow openings to irradiate diseased tissue, selectively activating therapeutic compounds while leaving healthy tissue untouched. The paper is the work of seven researchers affiliated with MIT’s Research Laboratory of Electronics (RLE), including Yoel Fink, a professor of materials science and electrical engineering and the RLE’s director; John Joannopoulos, the Francis Wright Davis Professor of Physics; lead author Alexander Stolyarov, a graduate student at Harvard University who is doing is PhD research with Fink’s group; and Lei Wei, a postdoc at RLE. The work was funded by the U.S. Army and the National Science Foundation, through MIT’s Institute for Soldier Nanotechnologies and Center for Materials Science and Engineering. 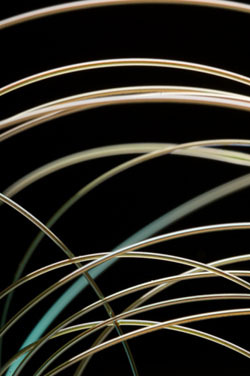 The newly developed fiber has a hollow core; surrounding this core are alternating layers of materials with different optical properties, which together act as a mirror. In the core is a droplet of fluid that can be moved up and down the fiber. When the droplet receives energy, or is “pumped” — in experiments, the researchers used another laser to pump the droplet — it emits light. The light bounces back and forth between the mirrors, emerging from the core as a 360-degree laser beam. As a display technology, the fibers have the obvious drawback that each of them provides only one image pixel. To make the fibers more useful, the researchers are investigating the possibility that the single pixel — the droplet of water — could oscillate back and forth fast enough to fool the viewer into perceiving a line rather than a colored point. Even before the researchers answer that question, however, the fiber could prove useful in the burgeoning field of photodynamic therapy, in which light activates injected therapeutic compounds only at targeted locations. Be the first to comment on "A New Fiber Opens the Possibility of 3-D Displays Woven from Flexible Fibers"